A fisherman from New Zealand was left baffled when he caught this see-through shrimp-like creature swimming near the surface of the ocean. Stewart Fraser was fishing with sons Conaugh and Finn 43 miles north off the North Island's Karikari Peninsula when he spotted the translucent 'shrimp' floating near the top of the water. Mr Fraser said: 'I was in two minds whether to haul it in, but curiosity got the better of me and I decided to take a closer look. 'It felt scaly and was quite firm, almost jelly like, and you couldn't see anything inside aside from this orange little blob inside it.The photo baffled Mr Fraser and all of his fisherman friends, who are still none more the wise as to what the creature could have been. Mr Fraser said: 'We have no idea what it could have been but it was quite something and I'd never seen anything like it before. 'However, Deborah Cracknell, research lead from the National Marine Aquarium in Plymouth, told MailOnline she believes the creature is a Salpa maggiore (Salpa maxima). Paul Cox, director of conservation and communication at the National Marine Aquarium, said: 'Little is known about these salps, however, they are often found in colder seas, with the most abundant concentration found in the Southern Ocean. 'The salp is barrel-shaped and moves by contracting, pumping water through its gelatinous body. 'It strains the water through its internal feeding filters, feeding on phytoplankton from the upper sunlit layer of the ocean. 'They have an interesting life-cycle with alternate generations existing as solitary individuals or groups forming long chains. WHAT IS A SALPA MAGGIORE? One theory to explain the mysterious fish is that it could be a salpa maggiore - a kind of marine invertebrate. Salps, as they are more commonly known, are found in both equatorial and cold seas, so the waters around New Zealand's Karikari Peninsula would be more than suitable for the translucent sea creature. They are spotted swimming alone just as often as they are seen in long, string-like colonies, and move by pumping water through their gelatinous bodies. 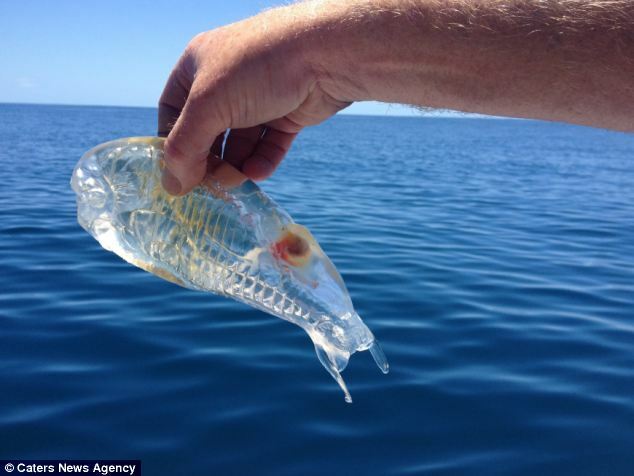 As a harmless creature that feeds only on plankton, a salp's see-through body is believed to be designed to avoid it being spotted by predators when floating near the surface. One remarkable species survival technique is the ability to create a clone of itself when food is abundant, which then grow at the fastest rate of any multicellular creature.